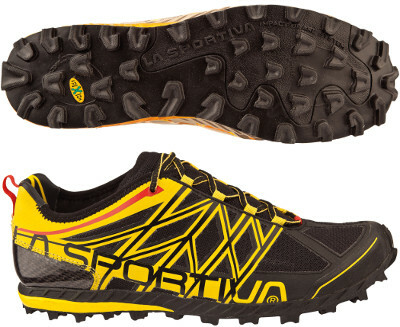 La Sportiva Anakonda are neutral trail running shoes. The brave Anakonda is a low profile trail running shoe with just 4 mm drop ready to go as fast as possible through muddy terrains. Enough cushioning for not so long distances and featuring a firm ride, it is a very responsive model with snug fit not recommended for those looking for wide toebox. Upper from Anakonda features a heavy-duty mesh in order to deliver enough protection against the usual amount of roots, rocks, and mud. TPU based heel counter provides extra rigidity for improved safeguard and stability but it is mandatory that it fits your heel because it is not going to adapt. Upper is more open at both sides so the shoe does not get waterlogged and drains water to keep your feet as dry as possible. Reinforced toe cap protects forefoot from external elements. Despite cushioning not being its best feature, the Anakonda features reliable EVA injected midsole for improved comfort and usual rock plate in the forefoot to defend against sharp objects. Well known Frixion XF outsole provides extremely good traction on any kind of terrain although it raises several concerns about durability.